Develop color recognition and sorting skills. Perfect for dramatic play and nutrition lessons. Explore a bushel of educational fun! Develop color recognition and sorting skills with bushels of realistic, relationally-sized produce. Perfect for dramatic play and nutrition lessons. 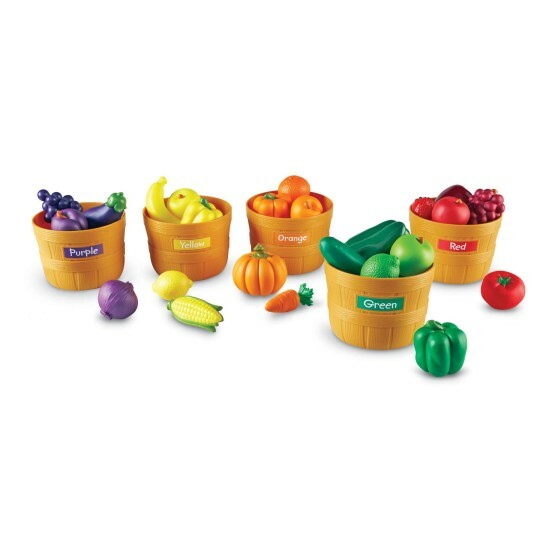 30-piece set includes activity guide, 25 foods with stickers for labeling and five 4"H x 5-1/2"-diameter baskets. Grades PreK+.